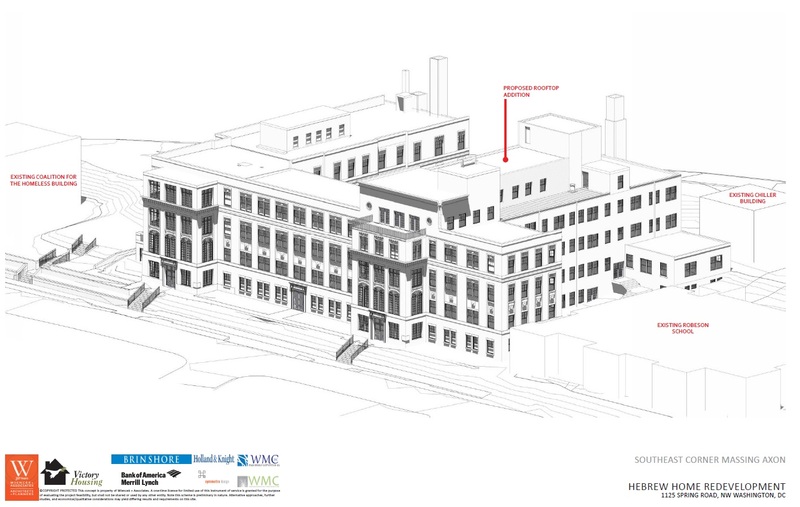 Historic Preservation Review Board Approves Restoration Plans for Hebrew Home on Spring Road | Park View, D.C.
At the January 25, 2018, Historic Preservation Review Board hearing, the Board approved the preservation plan for the renovation of the historic Hebrew Home building at 1125 Spring Road. The case was approved as part of the Board’s consent agenda. The hearing only focused on the overall plan for the historic structure, and not the proposed development east of the property as it does not encroach upon the historic site. 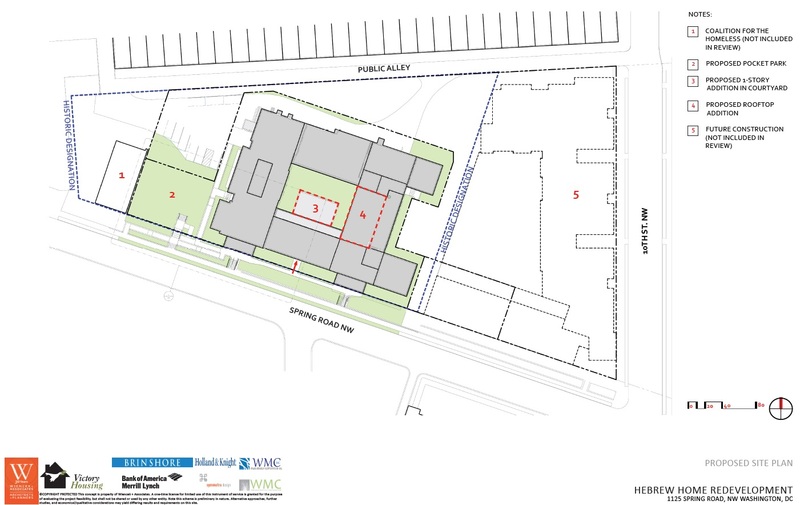 Site plan showing location of non-historic structures to be removed during renovations. The renovation plan focused on exterior modifications. The primary exterior modifications include complete replacement of existing (non-historic) windows and doors. Aluminum-clad wood windows with simulated divided lights are proposed. The development team consulted historic photographs in order to propose new windows that match the original windows as closely as possible with respect to operation and lite patterns. Restoration of the existing exterior masonry is also planned as part of the renovation. This will include cleaning and repair/repointing of the brick as necessary. 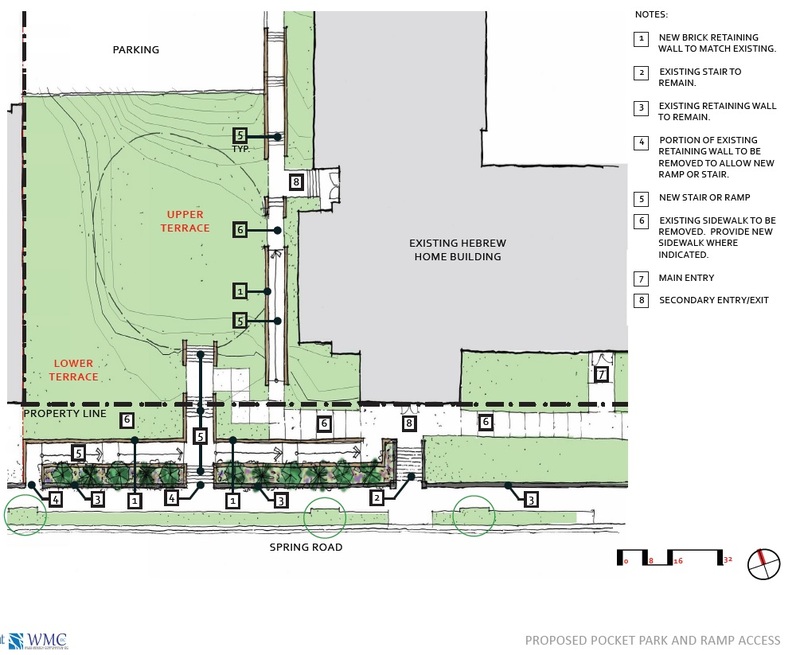 As part of the renovation, a limited number of selective reductions of non-historic exterior elements is proposed including removal of a one-story brick shed on the west side, a one-story open carport structure on the north side, an existing two-story free-standing utility building on the north side and a one-story walkway canopy connecting to the existing adjacent Robeson School building to the east. Two small additions were also proposed and approved. A one-story addition on the first floor within the existing interior courtyard (and not visible from the exterior) which will provide a multi-use amenity space for residents and a one-story addition on the fifth floor which will provide 2 apartments and a second means of egress from an existing amenity space overlooking Spring Road. 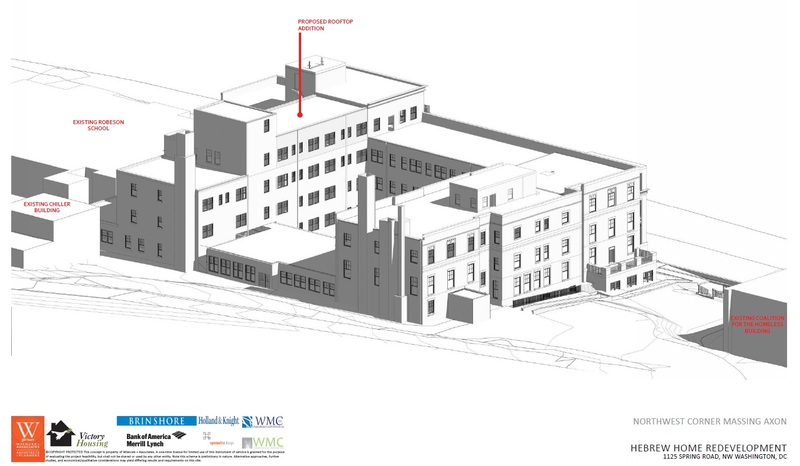 This proposed roof addition is located on the east wing adjacent to the interior courtyard and is set back substantially from the east building face to minimize (or eliminate) its visual perception from the public right-of-way. 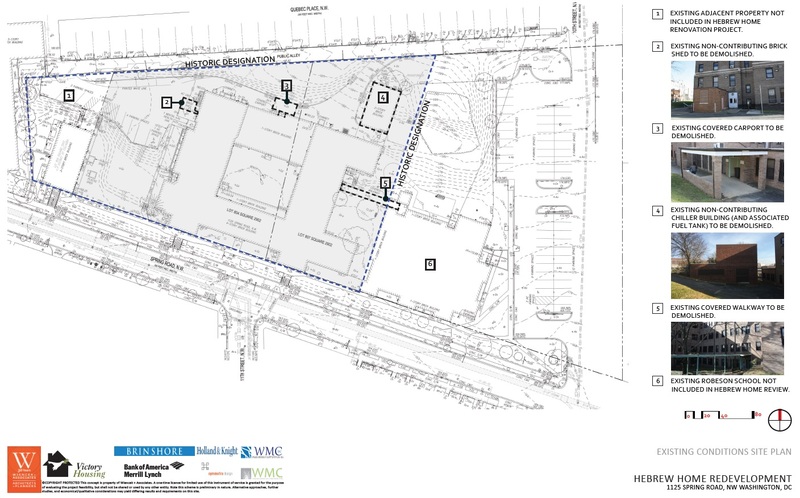 The existing open space along Spring Road between the Hebrew Home and the adjacent Jewish Social Services Agency building will be redeveloped to create a new pocket park accessible to the public. In keeping with the original character of this exterior space, the design will provide small passive-use spaces with minimal plantings. In order to provide access to the space from the Spring Road streetscape, a new ADA ramp and access stair will be constructed in public space. This will require minor modifications to the existing brick retaining wall at the back of the existing sidewalk. Below are some renderings filed with the HPRB case. This entry was posted on January 26, 2018 at 10:51 am and is filed under Architecture, Historic Landmarks, Housing, Restoration repair and maintenance. You can subscribe via RSS 2.0 feed to this post's comments. I’m more interested to see if the firm lives up to the promises the ANC made to us to have the new construction be traditional row house style. Feel like we’ve been bamboozled.